A magical reinvention of L’Engle’s classic story that all families should identify with – and embrace. 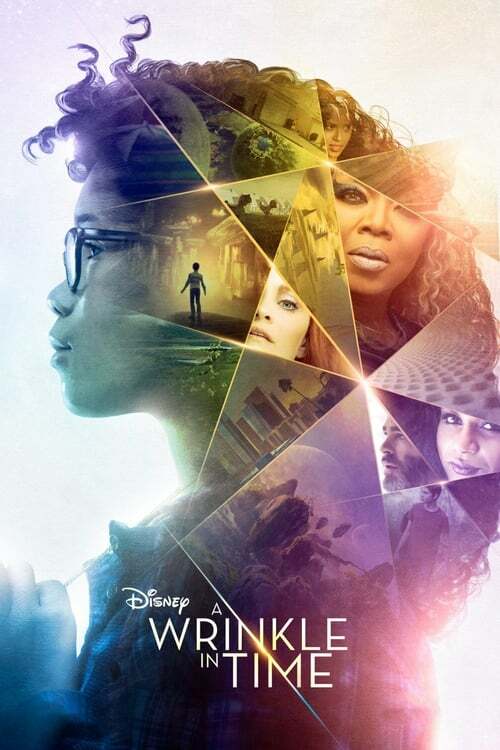 Still riding the wave of their box-office phenomenon Black Panther, Disney hits it out of the park yet again with another beautiful, heartfelt and powerful story with A Wrinkle in Time. Based on Madeline L’Engle’s classic young adult novel published in 1962 director Ava DuVernay (Selma), was determined to include a diverse cast and crew that resembled the real world. While the racial diversity did feel somewhat forced at first, it was soon forgotten as the relationships became more real, and everything kind of fell into place, just as DuVernay hoped it would. The story begins when blonde haired, blue eyed Mr. Murray (Chris Pine, Wonder Woman, Star Trek) accidentally discovers a new form of space travel and disappears trough a Tesseract. His multi-racial, curly haired daughter Meg (Storm Reid, 12 Years A Slave) is heartbroken as she’s forced to endure bullying, self-doubt, an aloof principal (Andre Holland), and all the normal teenage heightened emotions and troubles that audiences expect from a young woman whose father seemingly abandoned her when she was a little girl. Still, Meg doesn’t want to believe her dad is really gone, even while the world wants her to think that he did indeed leave her and the family, with no plans on returning. It’s not until Mrs. Whatsit (Reese Witherspoon) magically appears in their living room with a special message: Meg is the only one who can save her father from the film’s magical antagonist, The It. Buoyed with newfound hope, Meg, Charles Wallace (Deric McCabe) and their friend Calvin (Levi Miller) set out on an extraordinary and magic-filled journey across the universe. While a bit slow to reveal the magical wonder the story promises, once the film gets going the magic just keeps coming. With filming taking place in the mountains of New Zealand, a sequoia park in Northern California and a sound stage in Santa Clarita, I found myself overwhelmed by the glorious ness of the cinematography and special effects. However, it was the story behind the visual effects and the words behind the glamour of the celestial beings that stuck closest to my heart. Those of us, like myself, who were raised by a single mom know what it’s like to fend for ourselves at school, to stick up for our siblings and still offer the adult in the house a glimmer of hope, if only to keep it from fading altogether. Meg does all this beautifully, but when she’s the one who needs to be shown the way, the Mrs’s step in just in time. Mrs. Whatsit (Reese Witherspoon), Mrs. Who (Mindy Kailing) and Mrs. Which (Oprah Winfrey) bring their celestial beings to life in a gorgeous display of style, magic and wisdom. Through their lines and performances, I walked out of the theater believing that the farthest and darkest corner of my universe had a new light shining upon it, filling my doubts with hope, and my fears with courage. Amidst all the grown-up stuff going on, it was wonderful to see how the youngest and seemingly most vulnerable character, was also the strongest, with the brightest lift and purest love. And that was how Charles Wallace (Deric McCabe) stoke the show. This kid has range and is such a natural it’s almost scary. The only thing that gave me pause about the actor was that in his first scene, he forgot to enunciate his words as he tried to get his lines out with as much oomph as he could, leading to some confusion. However, either by trial and error, or multiple takes, the speech issues were resolved within the first few minutes of McCabe’s screen time, thus allowing his talent and personality to shine. Bellamy Young (Scandal), Michael Pena (American Hustle, Crash), and Zach Galifianakis (The Hangover, Birdman) also make appearances in the film. The parents, Mr. and Mrs. Murray, played by Chris Pine and Gugu Mbatha-Raw (The Cloverfield Paradox, Beauty and the Beast), respectively, delivered believable and emotional performances. Their familial bond was palpable even in the first few minutes of the movie, making it all the more difficult to watch the single mom and her kids go through life missing their dad. As a commentary on our world, both today as shown by DuVernay and in the 1960’s when L’Engle wrote her book, A Wrinkle in Time uses light and dark to portray the good and evil of our times, politically, culturally and economically. These issues continue to dwell in our society, thus making the story just as relatable now as it was then. Perhaps this may bring up the question of just how far have we come if we still need to be slapped in the face with the basic story of good and evil as told from a lost teenage girl’s perspective? While the book continues to be controversial, perhaps due to its overtly Christian themes, it will certainly prove more difficult to silence its underlying message as demonstrated in a film of such magnitude. Among its great performances and gorgeous cinematography, A Wrinkle in Time is filled with quotes that are sure to end up on magnets and calendars before the year’s end. While I definitely recommend this movie for the whole family, the story of a single mom and her two kids who dearly miss their dad is one that has been told before, though perhaps never quite so magically.